New York: Atheneum , 1974. First American edition of this translation, which is the first complete edition of Lei-Strauss’ landmark work. Octavo, original cloth. 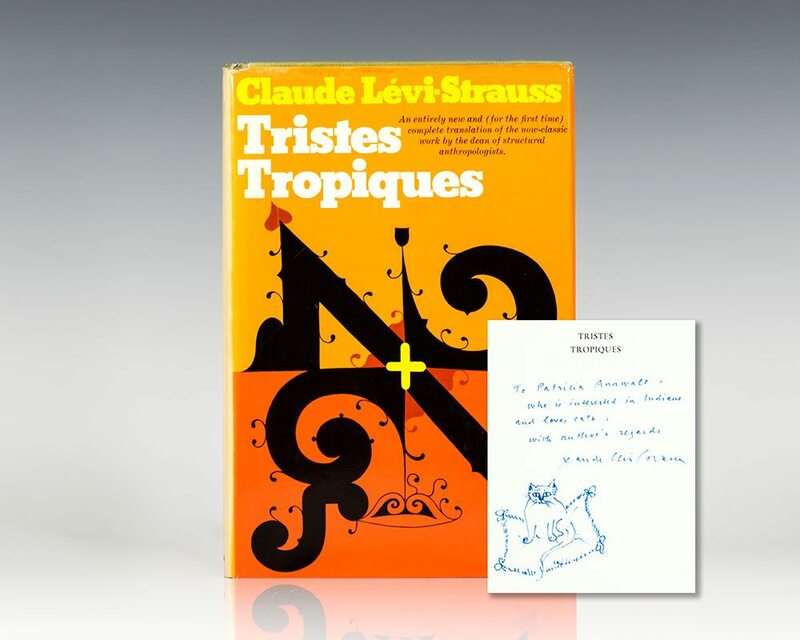 Inscribed by the author on the half-title page, “To Patricia Anawalt who is interested in Indians and loves cats, with author’s regards Claude Levi-Strauss.” Levi-Strauss has added a large drawing of a cat below his inscription. The recipient, Patricia Anawalt was an anthropologist and authority on Mesoamerican ritual and attire, She wrote several books, including “The Worldwide History of Dress”, which examined the costumes of a wide range of peoples, including Neolithic plant-fiber skirts, ancient Egyptian linen shifts and Mongolian shamanic robes. Translated from the French by John and Doreen Weightman. Fine in a very good faded dust jacket. Jacket design by Paul Bacon. A unique example. Tristes Tropiques is a memoir, first published in France in 1955. It documents his travels and anthropological work, focusing principally on Brazil, though it refers to many other places, such as the Caribbean and India. Although ostensibly a travelogue, the work is infused with philosophical reflections and ideas linking many academic disciplines, such as sociology, geology, music, history and literature. "One of the great works of the twentieth century" (Susan Sontag). 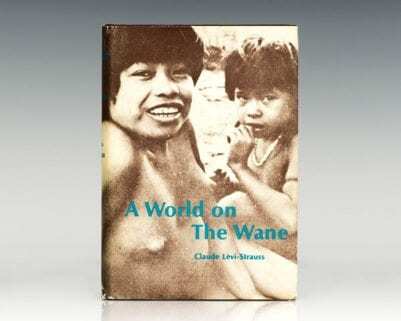 The World on the Wane. New York: Criterion Books, 1961. First American edition of Levi-Strauss’ experience among tribes in Brazil. Octavo, original brown boards, illustrated with 48 pages of photographs and 48 line drawings. Inscribed by Claude Levi-Strauss on the half-title page. Fine in a near fine dust jacket that shows light wear to the extremities. Translated from the French by John Russell.